Introduction: In June of 1979, Dr. Michael Gauderer introduced the novel concept of a procedure in which a sutureless approximation of a hollow viscus to the abdominal wall could provide a means of creating long-term enteral access for patients who are unable to swallow without undergoing formal laparotomy. This simple yet safe procedure was initially introduced in the pediatric population of patients who were unable to swallow secondary to neurologic syndromes. Currently percutaneous endoscopic gastrostomy (PEG) tube is widely used in patients of all age groups who require alternative nutritional support. However, the use of PEG tubes has become a controversial issue particularly among the geriatric population residing in nursing homes who suffer from severe dementia. Grant and Rudberg showed that the majority of these patients failed to achieve any meaningful improvement in nutritional status, functional status, or subjective benefit after the placement of PEG. Furthermore, Grant and Rudberg demonstrated a 30-day mortality of 23.9% in this geriatric population. There is a paucity of literature exploring why this patient population has such a poor outcome after PEG tube placement. This study hypothesizes that severely malnourished patients experience a higher number of post-PEG tube placement complications. Methods: Retrospective chart review of 289 subjects from October 2002 till October 2007 in a community-based hospital was conducted. Average age was 75 years old, 181 male and 108 female. Nutritional status was measured by preoperative albumin levels. . Albumin levels were defined as normal to be ≥3.5 g/dl, mildly malnourished ≥3.0 – 3.4g/dl, moderately malnourished ≥2.5 – 2.9g/dl, severely malnourished ≤2.4g/dl. Post-PEG tube placement complications which required tube replacement either percutaneously or operatively were analyzed. T-test statistical analysis (p<0.05) was conducted. 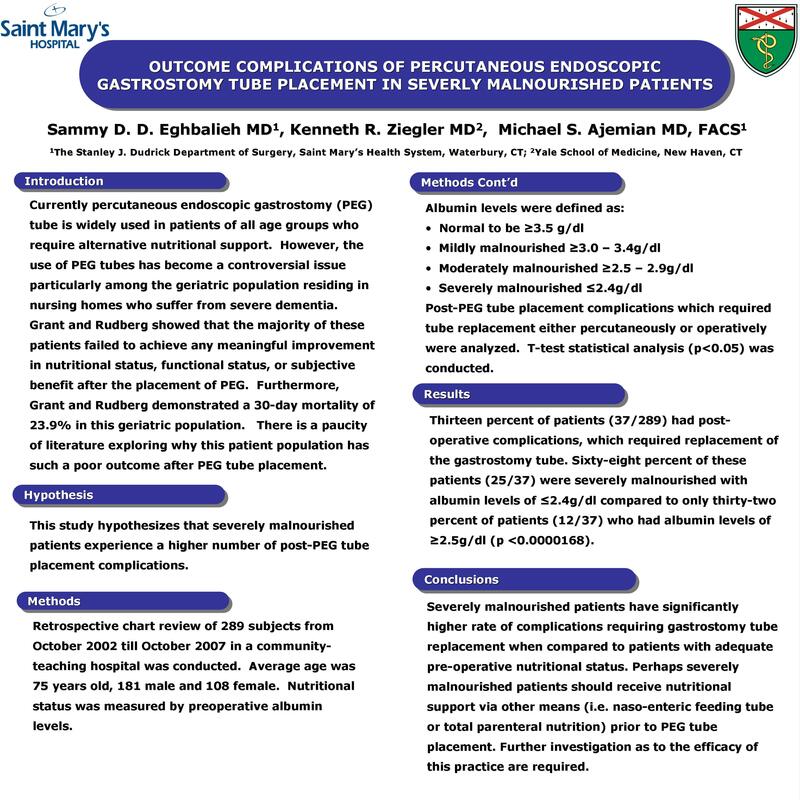 Results: Thirteen percent of patients (37/289) had post-operative complications, which required replacement of the gastrostomy tube. Sixty-eight percent of these patients (25/37) were severely malnourished with albumin levels of ≤2.4g/dl compared to only thirty-two percent of patients (12/37) who had albumin levels of ≥2.5g/dl (p <0.0000168). Conclusions: Severely malnourished patients have significantly higher rate of complications requiring gastrostomy tube replacement when compared to patients with adequate pre-operative nutritional status. Perhaps severely malnourished patients should receive nutritional support via other means (i.e. naso-enteric feeding tube or total parenteral nutrition) prior to PEG tube placement. Further investigation are as to the efficacy of this practice are required.